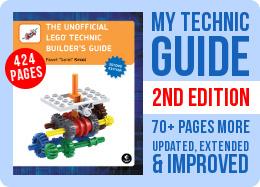 A steering system that ensures realistic steering geometry for any type of Lego wheels. Instructions available. A common problem with the Lego wheels is steering pivot: because of how rims connected to the suspension elements, the pivot is usually located at the edge of the wheel or even beyond it (in particular when using portal axles, like in the 9398 set). Such steering geometry is not used in real-world vehicles, and it has several undesired consequences: increased tire scrub, increased torque required to steer, and perhaps most importantly huge amount of space that must be left empty around the wheel. In the ideal situation the steering pivot is located exactly in the rim’s center: when this is not the case, the wheel “travels” forward and backward when steered, thus requiring extra room between the wheel and the fender. This doesn’t look realistic and it makes building a realistic-looking Lego vehicle quite a challenge: the typical solution is to make oversized fenders, which looks bad, especially in longnose trucks. There are very few Lego rims that allow near-perfect pivot location – most notably, the unique rims from the 8448 set which are extremely rare and not exactly pretty to look at. I was looking for a mechanical solution that would allow virtual pivot, and I’ve arrived at a multilink setup that, as I discovered shortly after, has been used in similar form by a number of other builders before me. Thus I can’t claim credit for the idea – I guess it is too basic to have one specific originator. The solution I have developed specifically for a large scale truck model relies on four 6-studs long links per wheel, moved by synchronized small linear actuators. 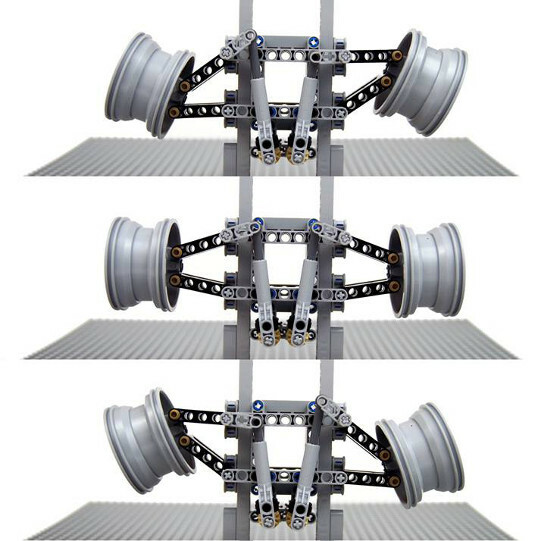 Each wheel is mounted on a Lego wheel hub and a near-perfect pivot is achieved regardless of the wheel used, except for extremely narrow or wide wheels. It is also sturdy, reasonably fast and easy to motorize. 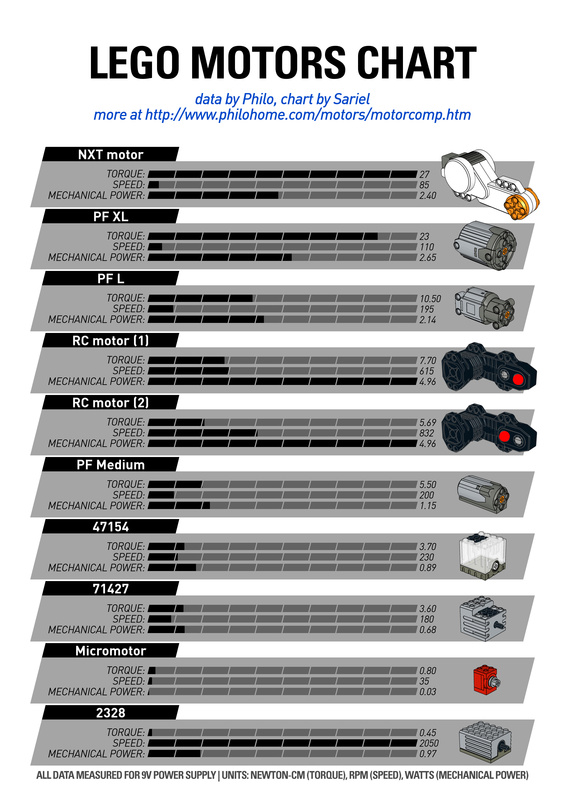 It also has several disadvantages: there is some backlash which makes it impractical for offroad vehicles (huge risk of bump steering), the left and right actuator have to be carefully synchronized, and it’s very difficult to add suspension or drive to this setup. Still, being relatively simple it makes a good starting point for experimenting with some complex suspension designs. Free building instructions for the entire unit are available in the Downloads section. Jessie, have you by any chance noticed that the last line of the description here reads “Free building instructions for the entire unit are available in the Downloads section.”? Hi My name is Jessie Robinson and I doing a project for my gateway class where we need to make a suspension and steering system for a car. My group was inspired by your simple design. Do you happen to have the instructions we can elaborate on. Hi. I was inspired by this thing about one month, and i found simplier solution of this multi-link thing.